Let the motivating begin! 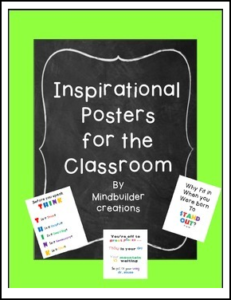 Here are a few posters that provide inspiration as well as thinking! Hang them around your room to keep the spirits high and ready to learn. I would love to hear your feedback. Also, don’t forget to follow me to find out about future freebies, store sales, and new products. Thank you for stopping by and as always Happy Teaching!